We think a tired dog is a happy dog! What better way to ensure good behavior and health to your best friend than to give the gift of exercise! We offer a basic walk and an extra long walk. 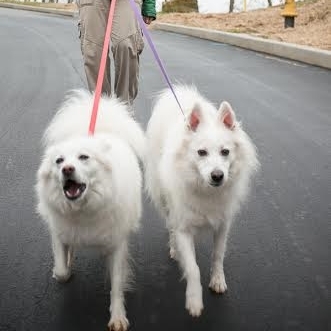 The basic walk is perfect for dogs that enjoy shorter more frequent walks, are sensitive to weather or are elderly. Our Basic visit lasts 20-30 minutes and is $20. The extra long walk is perfect if you've got a high energy hound or working breed that never seems to tire! This visit is designed to make sure your four legged- friend is worn out. We don't stop until they are tired! Usually this lasts 45 minutes- 1 hour, and often includes a field trip! Extra long walks are $30. Give your furry family a vacation too! We often hear from clients upon their return that it seems like their pooch or kitty barely noticed they were gone! While you are away, you can rest assured that we are providing care, entertainment and lots of stimulation for your fur baby. We are able organize any number of visits per day to meet your specific needs. In addition if you have a four-legged friend that just loves company or is a little anxious we offer overnight care! Our vacation pet sits are priced the same as our regular dog walks- $20 for basic visit/ $30 for extra long visit. Overnight pet sitting is $65 per night. Field Trips! Our pet field trips are popular for dogs that do well burning calories off leash in a dog park setting or that live in a neighborhood not suited for walking. We go to a nearby park, dog park, or neighborhood with sidewalks, to provide extra fun and a more ideal setting for exercise. Lots of parents love the extra energy, excitement and socialization that comes with a field trip. It's ideal for all around (physical and mental) stimulation for your dog! Additionally we offer Pet Taxi services. Vet or grooming appointments that don't exactly fit your schedule? Daycare closes too early to get there? You name it and we'll take your companion wherever they need to go! All additional services are $30/hour.